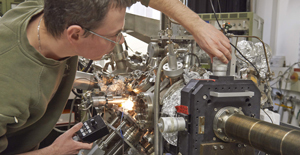 A team at the Laboratory for Attosecond Physics (LAP) in Garching (Germany) has constructed a detector, which provides a detailed picture of the waveforms of femtosecond laser pulses (1 fs = 10 -15 seconds). Knowledge of the exact waveform of these pulses enables scientists to reproducibly generate light flashes that are a thousand times shorter – lasting only for attoseconds – and can be used to study ultrafast processes at the molecular and atomic levels. 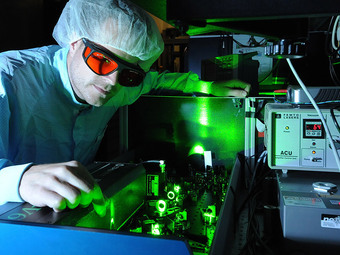 Modern mode-locked lasers are capable of producing extremely short light flashes that last for only a few femtoseconds. In one femtosecond light, which rushes from the Earth to the Moon in just one second, advances only three ten-thousandths of a millimeter. Such short pulses consist of only one or two oscillations of the electromagnetic field, which are preceded and followed by waves of lower amplitude that are rapidly attenuated. To be utilized in an optimal manner to probe ultrashort processes that occur at the level of molecules and atoms it is important to know the precise form of the high-amplitude oscillations. A team at the Laboratory for Attosecond Physics at the Max Planck Institute for Quantum Optics (MPQ) including scientists from Technische Universitaet Muenchen (TUM), Ludwig Maximilians-Universitaet Muenchen (LMU) and further co-operation partners has now developed a glass-based detector that allows to accurately determine the form of the light waves that make up an individual femtosecond pulse. 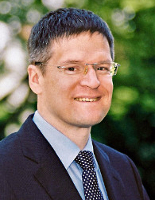 In the course of experiments performed over the past several years, physicists in the group led by Professor Ferenc Krausz (MPQ/LMU) and Professor Reinhard Kienberger (TUM) have learned that, when pulsed high-intensity laser light impinges on glass, it induces measurable amounts of electric current in the material. Krausz and his colleagues have now found that the direction of flow of the current generated by an incident femtosecond pulse is sensitively dependent on the exact form of its wave packet. In order to calibrate the new glass detector, the researchers coupled their system with a conventional instrument used to measure waveforms of light. Since the energy associated with the laser pulse is sufficient to liberate bound electrons from atoms of a noble gas such as xenon, the “classical” detector measures the currents caused by the motions of these free electrons. But there is a catch – the measurements must be done in a high vacuum. By comparing the currents induced in the new solid-state detector with the data obtained using the conventional apparatus, the team was able to characterize the performance of their new glass-based set-up, so that it can now be used as a reliable phase detector for few-cycle femtosecond laser pulses. The new instrument enormously simplifies measurements in the domain of ultrafast physical processes, because one can dispense with the use of cumbersome vacuum chambers. Moreover, in its practical application the technique is much more straightforward than the methods available for the mapping of waveforms hitherto. If the precise waveform of the femtosecond laser pulse is known, it becomes possible to reproducibly generate stable trains of ultrashort attosecond light flashes, each one a thousand times shorter than the pulse used to induce them. The composition of the attosecond flashes is in turn highly dependent on the exact shape of the femtosecond pulses. Attosecond flashes can be used to “photograph” the motions of electrons in atoms or molecules. In order to obtain high-resolution images, the length of the flashes must be tuned to take account of the material one wants to investigate. Highly sensitive and reliable measurements of physical processes at the level of the microcosmos with the aid of single attosecond light flashes of known shape should become easier to perform because, thanks to the new glass-based phase detector, the source of the energy to drive them – the waveform of the laser pulses – can now be controlled much more easily than before. 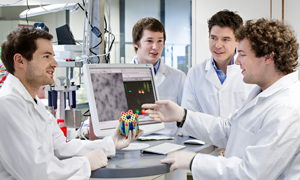 The research was funded by the European Research Council (ERC), the Marie Curie International Incoming Fellowship Program of the European Union, the German Research Foundation via the Cluster of Excellence Munich-Centre for Advanced Photonics (MAP), the Swiss National Science Foundation and the Alexander von Humboldt Foundation.